Glassdrumman Cottage has a fully equipped kitchen and can easily cater for a family on holiday and even additional visiting friends or relatives. The kitchen is equipped with an electric oven and four ring hob, a cabinet fridge/freezer, a dishwasher, a washing machine/dryer and a microwave, all contained in a fitted kitchen area with direct access to the open plan dining and sitting areas. There are ample plates, cups, mugs, bowls, glasses and all of the usual kitchen accessories necessary for family mealtimes. A selection of cookery books are on display and a high chair is available for young children and babies. The dining area is adjacent to the kitchen and has a large farmhouse style dining table that seats eight people and has views of the courtyard to the rear of the cottage and the countryside beyond. First trip to Ireland and picked the perfect cottage - perfection on a plate. Sincere thanks. Kev and Chrissy, Somerset, England. We are proud of our NITB Rating and work hard to maintain it. Glassdrumman Cottage - Read about the cottage, gardens, nature trail and much more! 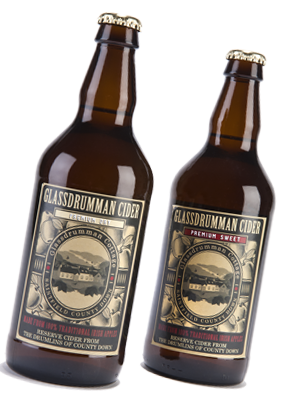 Glassdrumman Cider - Read all about Saintfield's first Craft Cider! 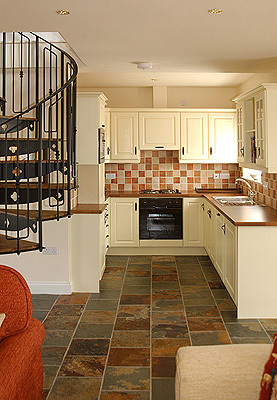 Glassdrumman Cottage - Follow us on Facebook for the latest reviews, offers, news and images! Glassdrumman Cottage,148 Monlough Road, Saintfield, County Down, Northern Ireland, BT24 7EU.